When you’re as tall and gawky as a giraffe, it’s easy for playing around to get out of hand. 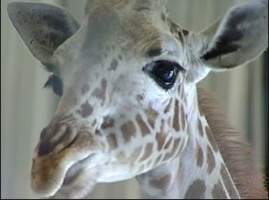 That’s what authorities say happened over the weekend when Griffy, a 20-year-old giraffe at Roger Williams Park Zoo in Providence, Rhode Island, headbutted a trainer so hard she had to be taken to the hospital. The big galoot just didn’t know his own strength! The woman was cleaning the area between Griffy’s display and the public when the 18-foot-tall critter swung his head down and the two made a melon-to-melon connection. The giraffe was fine, and the trainer remained conscious and was able to walk to safety under her own power. Still, maybe she’ll wear a helmet next time she goes to clean the giraffe cages! Griffy apparently is a big fan of being petted, and apparently just wanted to get his head rubbed by the trainer. Unfortunately, he overshot his mark and the two of them butted heads. Thankfully, Griffy is not aggressive by nature, so this was an unfortunate accident, and not a deliberate Sea World-style attack.